Ikkeri, literally meaning “Two-street”, was established by Keladi chiefs around 15th century. Ikkeri served as capital for Keladi Rajas for quite a while. The Aghoreshwara Temple is the only standing witness for regality of Ikkeri. The Aghoreshwara Temple in the city of Ikkeri is perhaps the most impressive holy structure closest to Jog Falls, what with its Hoysala-Kadambra style, its intricately-carved wall sculptures, and the three effigies near its front entrance. Temple which is dedicated to Lord Shiva was constructed using granite stones. The architecture is a unique blend of Vijayanagara, Karnataka Dravida Style, Chalukyas and Hoysalatss. 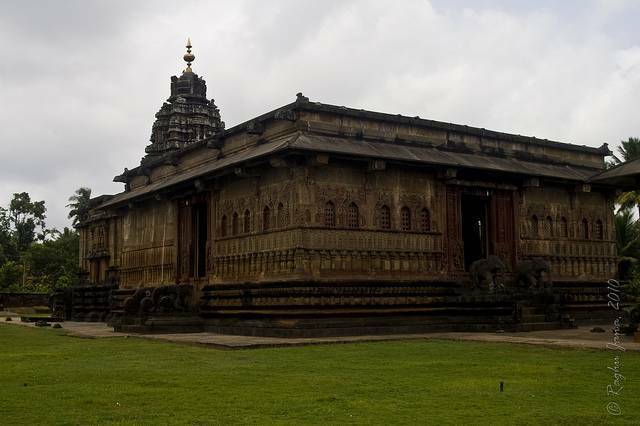 The pedestals and walls were highly decorated by intricate carvings, old Kannada manuscripts and sculptures.